6. Position the graphite electrodes inside the basin, dip in the piece you want to anodize for about 45-60 min at 1.5 A/dm2, the workpiece is connected to the positive pole and the two graphite sheets to the negative pole. 8. Dye --> The rinsed workpiece is now dipped in the dyeing bath heated up to 50 °C. Move it around a bit to accelerate the absorption of the dye. 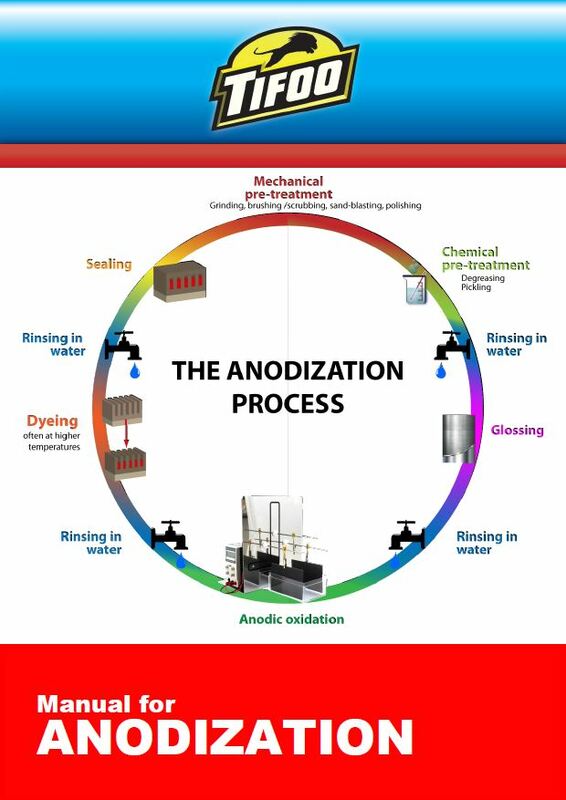 The dyeing bath's concentration depends on the dye itself and on the desired saturation. According to the colour's intensity and the bath's concentration, the immersion time is from 2 to 20 minutes. More time in the dyeing bath means a more intense colouration of the workpieces. Thanks to that, you will be able to create light colourations as well as very saturated dyes very easily - including the different shades between the two. 10. Seal --> The workpiece is dipped in boiling water for about 60 minutes at at least 96 °C. This closes the pores of the surface and the compound is transformed into its final form responsible for the extreme hardness of the layer. We recommend distilled water!